Punchy and at the same time full of delicate floral notes and hints of vanilla, the No.5 has an underlying bitterness which is pleasantly reminiscent of cedar wood, which gives depth to the smoke. Very similar to the Montecristo No.4, the No. 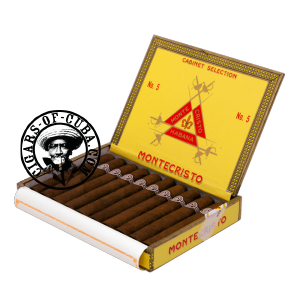 5 is more direct and will burn faster giving the impression that it is a stronger cigar. Very similar to the Montecristo No.4, the No. 5 is more direct and will burn faster giving the impression that it is a stronger cigar. A solid earthiness dominates this minuto with some pleasant woody, floral and spicy notes.